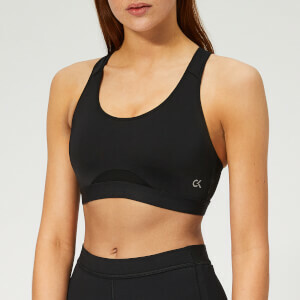 Black sports bra from premium activewear brand, LNDR. Crafted with a lightweight, quick-drying material, the ‘Hype’ bra top comprises a sleeveless design with a rounded neckline and a front zip fastening. Removable cups combine with elasticated rear straps and underband to provide extra support on the move, while subtle branded detail adds the finishing touch.